We have a brand new Shazam! TV spot, which showcases some new footage from the upcoming DC Comics adaptation. It's a good time to be a DC fan, after a rocky few years. Yes, movies like Batman v Superman: Dawn of Justice and Suicide Squad have fans, but they proved to be divisive and the fanbase got downright ugly. However, thanks to Wonder Woman, Aquaman and, by early accounts, Shazam, things are looking up. Now, we have another look at DC's latest ahead of its debut in theaters next month. This particular TV spot repackages some previous footage with new footage that highlights the central conflict. Shazam, who is actually, in reality, just a 14-year-old boy named Billy Batson who is gifted Superman-esque powers from an ancient wizard, must fight the evil Dr. Thaddeus Sivana, a man obsessed with Billy's newfound powers. As we see in the footage, Sivana is going to use Billy's adopted family in order to try and get to him. This spot is heavy on the action and emotion. One could even argue it's kinda spoilery, but nothing too crazy. Setting aside the mess that was Justice League, if we look at the solo movies, DC is putting together a nice little string of hits here. Wonder Woman was a major critical success, while also doing more than $820 million at the global box office. Aquaman wasn't quite as embraced by critics, but it did cross the $1 billion mark and proved to be exceedingly popular. 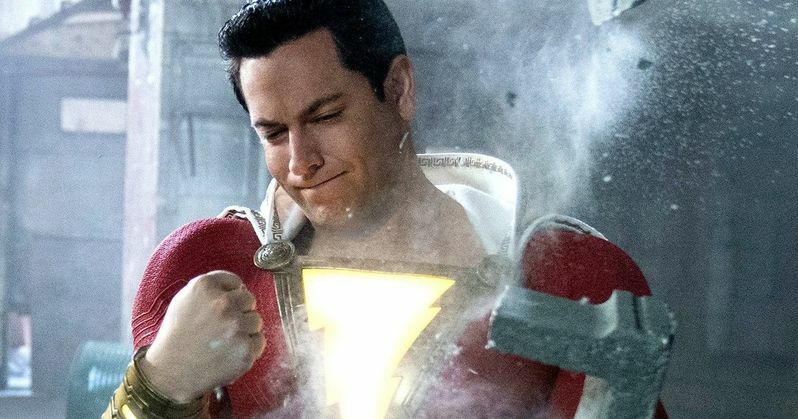 While Shazam hasn't hit theaters in wide release yet, critics are loving it and the response from the recent Fandango preview screenings has been quite solid as well. And, given how much money it made during those preview screenings, all signs point to this being a financial success as well. David F. Sandberg, whose previous credits include Lights Out and Annabelle: Creation, is in the director's chair, working from a screenplay by Henry Gayden and Darren Lemke. The cast includes Zachary Levi is the titular hero, with Asher Angel playing the young Billy Batson. The ensemble is rounded out by Jack Dylan Grazer, Grace Fulton, Faithe Herman, Ian Chen, Jovan Armand, Cooper Andrews, Marta Milans and Djimon Hounsou and Mark Strong as Dr. Sivana. It would seem that the light-hearted tone of these more recent efforts is resonating more with audiences, when compared to Zack Snyder's darker efforts. We've also go Todd Phillips' Joker with Joaquin Phoenix coming later this year, which will be darker in tone and won't take place in the same continuity as the DCEU. Next year will see the release of the Harley Quinn spin-off Birds of Prey and Wonder Woman 1984. Unless something really disastrous happens, it appears as though the studio has finally cracked the code with this franchise. Shazam arrives in theaters on April 5 from. Warner Bros. be sure to check out the new TV spot below.